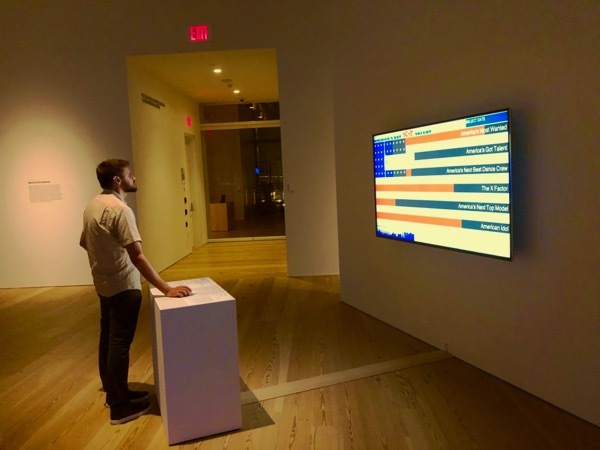 SOUND SCREEN – 2001 | JONAH BRUCKER-COHEN, PH.D. SOUND SCREEN – 2001 – JONAH BRUCKER-COHEN, PH.D.
A musical instrument that generates tones and patterns by tilting and leaning. Sound Screen was an LCD handheld device that allowed users to create custom patterns on an LCD screen that are then read as notes and played through speakers. Each character represents a different note and the spaces between characters represent the time interval betwen notes. The interaction works by lean and tilt. Leaning on the device will cause the cursor to move either left to right or up or down. Tilting or shaking the device will erase the drawing like an electronic etch-a-sketch. Once the cursor reaches the end of the screen, the remaining pattern will play the appropriate composition. 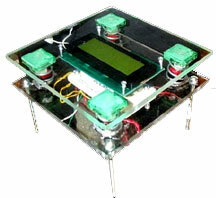 The system uses an 4 x 20 character LCD screen from Seetron.com and four springs attached to two piece of plexiglass with momentary switches underneath each spring. When a spring is pressed, the button is triggered and moves the cursor accordingly. 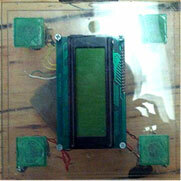 The last switch is a mercury tilt switch which is located underneath the bottom piece of plexiglass.